The Lady Spartans Swimming and Diving Team hosted the Cheshire Rams at the Orange Pool on Friday, Oct. 19. Amity knew that this was going to be a battle, and they worked just as hard as always, but this one simply went in Cheshire’s favor 98-80, and Amity dropped to 10-2 for the season. 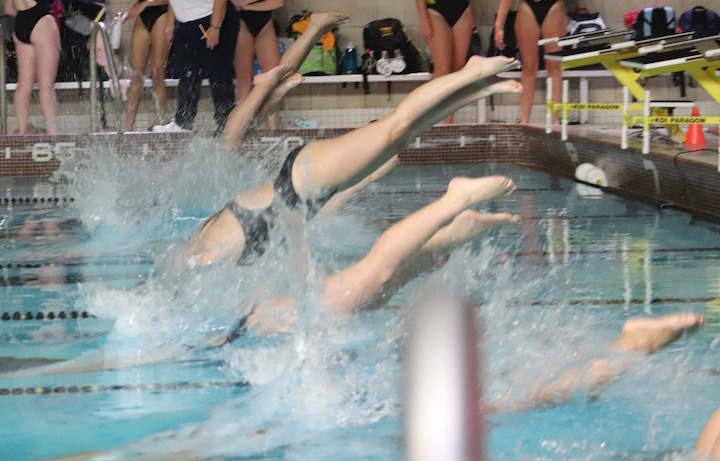 The Lady Spartans Swimming and Diving team hosted the Branford Hornets in Orange on Tuesday night. Once again, our girls showed spirit and skill and won their fifth consecutive meet. 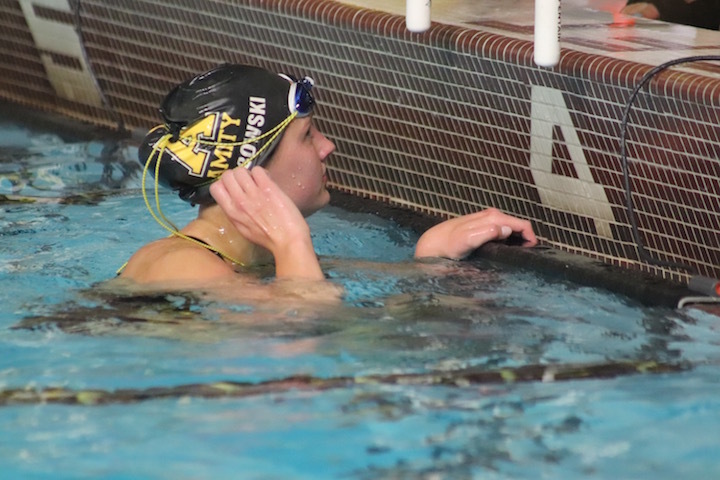 The Swim meet between Amity and Xavier came down to the last event on Thursday night in Orange. This was a tough, neck-in-neck battle with two strong teams with similar records. In the end, the freestyle relay team of Ben Bacal, Sergey Savelyev, Zac Babbitz, and Colin Roy pulled Amity to a 94-89 victory. Amity Varsity Boys Swimming and Diving team will take on Wethersfield at the Orange Community Center Pool, Tuesday, Feb. 25 at 7:30 p.m. This meet was changed from Wethersfield High School to Orange. The Amity Boys Varsity Swimming and Dive Team hosted Sheehan at the Orange Town Pool Thursday night and logged its 6th consecutive win — 94-76. Like Ol’ Man River, the Amity girls swim team just keeps rolling along. The Lady Spartans improved their record to 8-0 Thursday when they downed Sacred Heart Academy 102-76 at the Orange Community Center Pool. This meet was Anna Lu’s turn to be in the spot light. In addition to winning both the 200-yard freestyle (1minute, 58.29 seconds) and the 500 free (5:18.05), Lu anchored Amity’s winning 200 free relay. She teamed with Sydney Formica, Lauren Perrone, and Dana Chung to post a first place time of 1:47.43. Madeline Snow placed first in the 200 individual medley (2:16.57) and joined with Mollee Lasto, Natalie Ambrosey, and Melissa Gulia for a winning time of 2:00.91 in the 200 medley relay. Additional Amity winners include: Carly Young (diving—169.45), Dana Grindall (100 butterfly—58.11), and Chung (100 free–56.32). Jamie Robinson was a bright spot for the visiting Pacers as she claimed both the 50 free (27.18), and the 100 breaststroke (1:19.27). 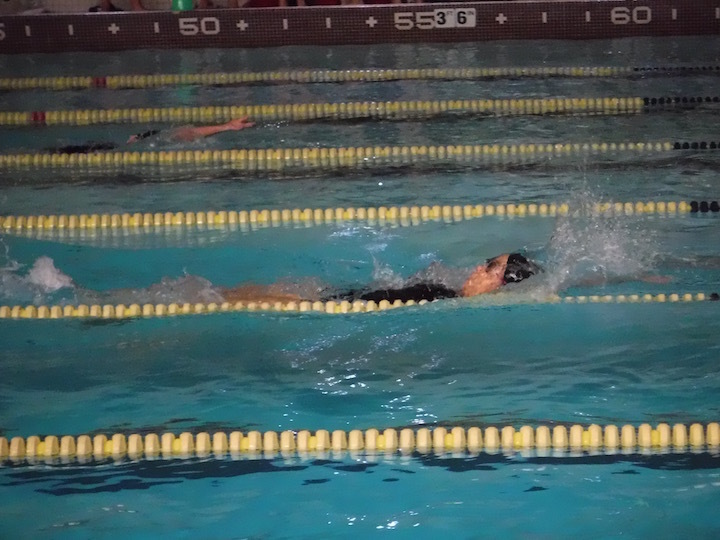 As usual, Amity built a big lead and then chose to swim exhibition in the meet’s final three events. This loss drops the Pacers’ record to 6-3. Amity returns to action on Tuesday, October 16th to swim Mercy at the Wesleyan University pool in Middletown.